The product line debuts with figures of Geralt, Triss, and Ciri. CD Projekt Red's The Witcher 3: Wild Hunt will be getting a new product line this fall from Dark Horse Deluxe. According to the announcement, the products will include statues, busts, action figures, prop and jewelry replicas, barware, stationary, and more. The line will debut with a set of figures - Geralt, Triss, and Ciri, followed by Yennefer and Eredin. Each will be custom painted, and will cost $29.99. "We are truly excited to bring the Witcher 3 characters to life! 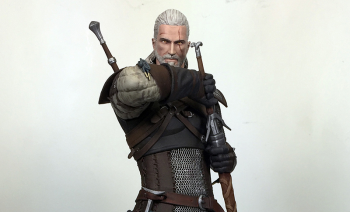 Wild Hunt fans requested figures of Geralt, Ciri, Yen, and other collectibles multiple times, and now, thanks to this cooperation, we're finally able to fulfill these requests without putting an arm and a leg on the price tag," said CD Projekt Red business development manager Rafał Jaki. "I truly hope Witcher fans notice all the love and the excellent craftsmanship put into creating them!" "Although Dark Horse has been bringing Witcher forward as graphic novels and art books for a couple of years, we have only begun exploring Geralt of Rivia's world. And there is quite a world to explore! We are developing a variety of collectible products, in conjunction with the team at CD Projekt RED, with the initial launch of figures as the portal," noted Dark Horse's VP of Product Development, David Scroggy. "We are planning a colorful and untamed range of high-quality enhancements to one of the most beautiful and original games we have seen. We hope this journey is a long one, and that fans will join us for the ride." In addition to The Witcher 3 products, Dark Horse also revealed Halo 5 Guardians collectibles, along with the addition of the Night King to its Game of Thrones lineup.